The International Space Station (ISS) U.S. National Laboratory is enabling a new era of research in space aimed at improving life on Earth. 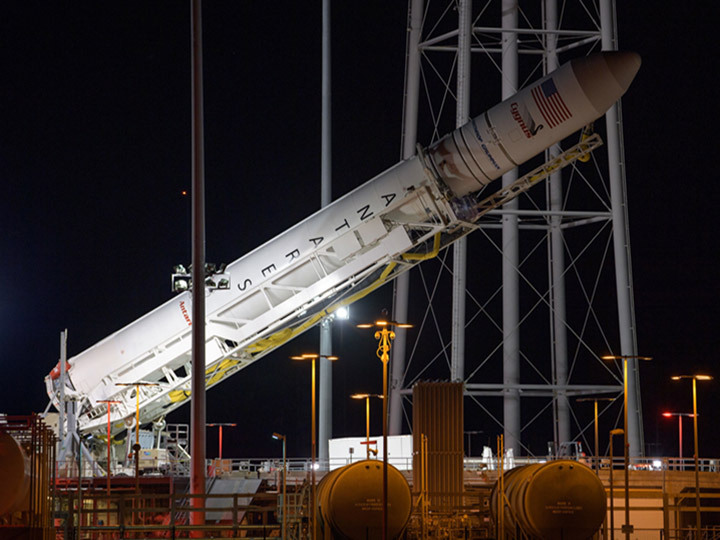 The 11th Northrop Grumman Commercial Resupply Services (NG CRS-11) mission is slated for launch no earlier than April 17, 2019, carrying multiple ISS National Lab payloads. The NG CRS-11 mission includes a variety of payloads representing diverse science investigations, ranging from the life and physical sciences to Earth observation and technology demonstration, as well as educational experiments intended to engage and excite the next generation of scientists and engineers. Below are highlights of sponsored ISS National Lab investigations that are part of the NG CRS-11 mission to the space station. This physical science experiment will evaluate airspeed and temperature of elevated airflow created around an obstruction using a small circular fan within a sealed environment. Compared to a series of fluid dynamics models, airspeed and thermal measurements can help validate and calibrate such simulations in microgravity. This investigation increases the accuracy for Computational Fluid Dynamics simulations and supports improved development of technology for thermal control in microgravity and ambient environments on Earth. For this project, EntrySat, a nanosatellite in the form of a 3U CubeSat, will be deployed into low Earth orbit and then re-enter Earth’s atmosphere. During the re-entry phase, EntrySat will collect measurements and data about the CubeSat’s environment (temperature, heat flux, acceleration, drag force, and pressure) and integrity (attitude, position, rotation, and speed). Acquired data will be transmitted back to the ground in real time. EntrySat will be injected into a trajectory representative of an uncontrolled atmospheric re-entry with both very low slope and high orbital velocity. No propulsion subsystem or re-entry protection subsystems are used during the destructive phase of flight, thus EntrySat will respond to the atmosphere in a similar manner as some orbital debris. In verifying the aerothermodynamic models of re-entry, EntrySat seeks to increase the accuracy of trajectory predictions for known space debris and other small orbital objects. This project aims to produce high-quality ZBLAN optical fibers in microgravity using the Orbital Fiber Optic Production Module. ZBLAN fiber has very low optical loss and high commercial value, with applications in telecommunications, remote sensing, and laser development. High-quality ZBLAN fibers are difficult to produce on Earth due to the formation of impurities in the fibers resulting from gravity-driven forces. Production of ZBLAN in microgravity has been found to significantly reduce such impurities, which could result in higher-quality fiber than can be produced on Earth. KRAKsat is a student-devleoped nanosatellite that tests a ferrofluid reaction wheel for stabilizing its orientation in low Earth orbit. KRAKsat is comprised of ferrofluid in a torus-shaped container and eight “C” shaped electromagnets. The electromagnets are sequentially turned on, generating a rotating magnetic field that accelerates the ferrofluid. Ferrofluid accelerating in the torus creates a torque that rotates the satellite. KRAKsat stabilizes its orientation through acceleration of the ferrofluid in the torus. The data received from magnetometers, gyroscopes, and accelerometers are downlinked to Earth for analysis, helping to determine whether a ferrofluid reaction wheel has potential applications in nanosatellites. In-Orbit Demonstration-1 Global Environmental Monitoring Satellite (IOD-1 GEMS) demonstrates a commercial microwave weather observation satellite service developed by Orbital Micro Systems. This technology could provide more accurate and timely weather data and help reduce the cost of weather observation infrastructure. This project seeks to demonstrate the technical and commercial feasibility of in-orbit manufacturing of optical ﬁbers for data transmission. Fluoride optical ﬁbers have demonstrated a 10- to 100-fold signal loss reduction compared with traditional silica optical ﬁbers, which could dramatically improve the cost and efﬁciency of communications systems and the internet. However, imperfections that occur during manufacturing on Earth prevent ﬂuoride optical ﬁbers from achieving this reduction in signal loss. Fiber drawn in a microgravity environment has shown substantial improvement in properties compared with fiber fabricated on the ground. A glass rod is softened by heat, pulled into a thinner fiber and put on a spool within a single box enclosure designed for the microgravity environment. In-orbit manufacturing of optical fiber on a platform such as the ISS provides an attractive opportunity for commercial utilization of space platforms. Materials International Space Station Experiment-11 (MISSE-11) is a suite of experiments. Each experiment is custom-mounted to decks that are installed in each half of a MISSE Sample Carrier (MSC). Six sample decks (three MSCs) deploy as part of the MISSE-11 mission, with a total of 99 individual NASA and commercial samples. This will put the total number of MISSE samples in orbit to 349, as MISSE-11 joins MISSE-10 and elements of MISSE-9. The MISSE Flight Facility platform provides a commercially available materials science and component testing facility, which houses projects on the outside of the space station, allowing for researchers to leverage the extreme environment of space. The Quest Institute-NanoLab Unit consists of an investigation containing 14 student-developed experiments. Each experiment tests a hypothesis or demonstrates a technology. These experiments advance space exploration in a variety of ways, from improving the accuracy of crystal oscillators for time-keeping and telecommunications to decreasing power consumption, protecting the health of crew members and equipment in space, and shedding light on the how spaceflight affects the human nervous system. The primary benefit of this investigation is providing students with hands-on experience conducting research in space and inspiring the next generation of scientists and explorers. The demand for smaller spacecraft has grown significantly over the last several years due to miniaturization technologies and the availability of deployment from the ISS. As a result, small spacecraft deployments have become valuable for technology demonstrations, gap fillers for larger satellites, and mature, revenue-generating operational satellite constellations. The deployment systems developed by SEOPS, LLC will enable the launch of satellites whose missions benefit life on Earth—from companies building crucial data applications and enhanced communications systems to projects aimed at raising the technology readiness level of technological components such as sensors. On this mission, SlingShot will be replenished with hardware supplies. Payloads associated with this replenishment will be launched on SpaceX’s 18th commercial resupply services mission to the ISS. Commercial Service Provider: SEOPS, LLC. Story Time From Space combines science literacy outreach with simple science demonstrations recorded onboard the ISS. Crew members read five science, technology, engineering, and mathematics-related children’s books in orbit and complete simple science concept experiments, all of which is video recorded. Video and data collected during the demonstrations are downlinked to the ground and posted in a video library with accompanying educational materials. Swiatowid’s goals include satellite miniaturization, the development of new concepts in the CubeSat market, and the evolution of new, cheaper technologies for high-resolution Earth imaging with improved revisit times. Swiatowid CubeSats are built with industry- and automotive- quality components and technologies. By using SatRevolution’s proprietary software solutions, it is possible to improve image resolution up to 3-meter GSD (Ground Sampling Distance) in a 2U CubeSat. This project aims to examine nanoparticle behavior in microgravity, toward investigating the manufacture of targeted nanoparticles that encapsulate drugs in tiny cell-like bubbles called nanosomes to treat Alzheimer’s and other diseases. Although this investigation focuses specifically on novel therapeutics for Alzheimer’s disease, the same methods of studying nanosome efficacy can be applied to other cell types and other diseases such as cancers, HIV, multiple sclerosis, Parkinson’s disease, and other chronic disorders. The manufacturing process that could result from this research could also be applied to other types of precision-manufactured targeted therapies. The Virginia CubeSat Constellation aims to measure the orbital degradation for a constellation of CubeSats and provide undergraduate students hands-on mission experience in both spacecraft design and manufacturing. Presently, more than 140 students from four universities are involved in the project to develop the satellites and the software to analyze the data. By offering an industry project of this magnitude at the undergraduate level, engineering students get first-hand experience with all aspects of a real-world project.